I received a set of Malibu True Wireless Earbuds by Soundstream. This company is part of Epsilon Electronics, noted for their excellent auto and watercraft sound systems. Malibu is a perfect name for these earbuds. Malibu earbuds are very nicely stored and charged in the sleek and very robust case that is charged using a standard micro USB cable (supplied). The case has a very thin slot to display the LEDs from the earbuds inside the charging case, showing their charging status. The charging case has one LED that shines through the small silicon pull strap used to open the case that indicates the cases charging status. This charging cylinder is good for three charging cycles of the earbuds. The play time was just a little over two hours before “low battery” was repeated audibly every 15 seconds. The charging times of the earbuds and case are about one hour and two hours respectively. The earbuds are small, and they have an elegant design that conforms and fits unobtrusively in my ear. If they were flesh toned they would be unseen by the casual observer. Nice design Epsilon Electronics! Three sizes of ear tips are supplied. The one multi-function button (MFB) works well and performs the same functions with either earbud. Functions are: Pause/Play (one press), Forward a track (two presses), and Back a track (3 presses). As I have said in my previous MyMac earbud reviews, fit is important. Using the included Malibu tips while cycling I repeatedly needed to reinsert and tighten them after riding over even small bumps in the pavement. Earbud fit is very individual, so I would not discount these unusual headphones on that account. Just make sure they are easy to return if they don’t fit snugly. Audio performance was clear and smooth with no harshness in the mids or highs when the Malibu tips were fitting me. Overall the sound was quite good, better then most OEM supplied earbuds, but not up with the best wireless earbuds that I have tested, such as the Leophile EEL. On the plus side, the sound quality while using my iPhone phone (which only comes through the left earbud) was excellent for both the caller and the receiver. 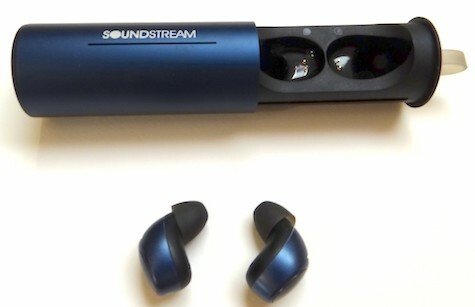 The good folks at Soundstream took to heart what I reported about the fit and wind noise problems with the Malibu wireless earbuds. Within a few days I received an email, alerting me of the delivery of some prototype sample ear tips to try out. A few days later I received them in the mail. I was hopeful that these trial tips would improve the fit and the noise cancellation properties. They hit the jackpot on both issues. I tried the three sizes of foam style ear tips; they all fit but I found the medium size to fit the best and be the most comfortable. After charging (I’ll get to that later) I put these improved buds through my usual testing routine. Riding my bike to the gym is the noise cancellation test and, honestly, I was surprised by the improvement! Even at 33mph with a head wind I could hear “The Flecktones” jamming away clearly. Much less wind noise and ambient noise of the gym were evident using the foam ear tips. The fit is great, barely needing to adjust them throughout my workout routine. I always understood that fit helped the sound quality but the refitted Malibu earbuds proved it. The bass now has a punch it was lacking before, the mids and vocals have more presence, and the highs are still clear, precise, and smooth. Great sound! A much improved experience in all respects. One down side I did find was I could not recharge the earbuds! 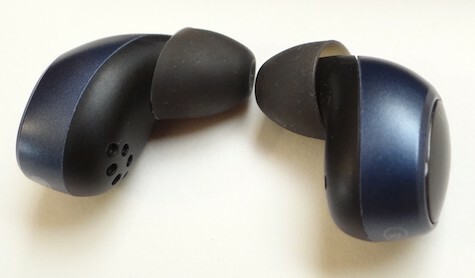 The prototype ear tips would not allow me to recharge the earbuds without removing the new foam tips and installing the original tips. I hope that the design team will keep the charging case as is and design a foam tip that will allow the charging case to close without all the hassle. 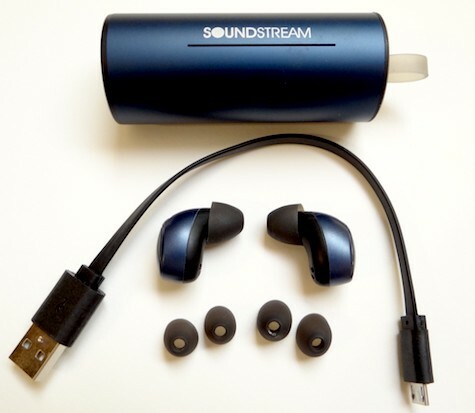 Here’s hoping that Soundstream includes a redesigned foam ear tips in future shipments of Malibu earbuds. With the new ear tip design (hopefully to fit in the charging case) I will give the Soundstream Malibu wireless earbud a MyMac Review Rating 8 out of 10. Microsoft’s online and physical stores are selling this product. Soon they will be available at Fry’s Electronics in the U. S.
The design looks great and if the earbud tips fit, Malibu may be just the thing for you.